Chick-fil-A doesn't mess around when it comes to handing out free food. Between its annual Cow Appreciation Day celebration and all sorts of giveaways tied to its new restaurant openings, the ever-popular -- often polarizing -- fried chicken sandwich purveyor regularly doles out free meals by the grease-stained bagful. Now, Chick-fil-A has launched yet another appetizing offer: free chicken nuggets throughout the entire month of September. 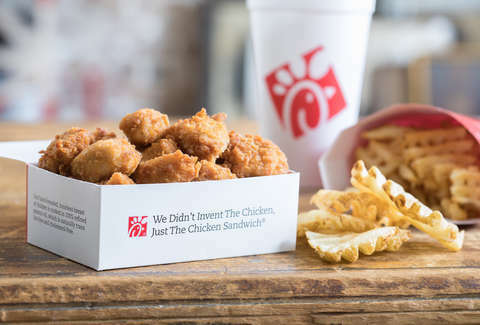 Here's the deal: From now through September 29, Chick-fil-A will treat you to a free 8-count order of chicken nuggets if you download the Chick-fil-A One mobile app and create an account or sign in to your existing account, a company spokesperson told Thrillist. The complimentary nugs offer will automatically appear in the "My Rewards" section of the app and it's redeemable for either crispy, pressure-cooked chicken nuggets or grilled chicken nuggets at the chain's more than 2,300 locations nationwide. You don't have to buy anything to get your hands on the dippable chicken, and better yet, you don't even have to wear a cow costume in public... that is, unless you really want to. Chick-fil-A describes its nuggets as tender pieces of all-breast chicken meat that are seasoned, breaded by hand, then pressure cooked in refined peanut oil for a crispy outer texture. As for the grilled nuggets, they’re marinated with a blend of seasonings and, well, grilled instead of pressure-cooked in oil for a “backyard-grilled taste.” Usually, they’d set you back $5.09 or $5.99, respectively. Your sauce options include zesty buffalo, garlic & herb ranch, BBQ, honey mustard, Polynesian, Chick-fil-A sauce, and sweet & spicy sriracha. Unless you want to settle for dipping them in ketchup. Speaking of chicken nuggets, Chick-fil-A recently unleashed new, 30-count orders of 'em at its locations nationwide. You're not getting that many for free, but the 30-count option could come in handy for all those times an 8-count just won't cut it. The chain has also added Waffle Potato Chips and an improved Fruit Cup to its menus along with new Grilled Chicken Bundle and Spicy Chilled Grilled Chicken Sub Sandwich catering options. Then again, why would you order Waffle Potato Chips when you can get Waffle Fries? Chick-fil-A said the month-long nugget feeding frenzy is meant to highlight its redesigned app and refreshed Chick-fil-A One rewards program, which now includes three tiers: Chick-fil-A One Member, Chick-fil-A One Silver Member, and Chick-fil-A One Red Member, according to the company. Basically, the more you spend, the more rewards (i.e. free food) you'll earn. To reach the Silver or Red membership status, you'll have to earn 1,000 points and 5,000 points in a year, respectively, but you'll end up getting more points per dollar you spend and earn rewards faster, among other perks. "We want to thank the millions of customers who have joined Chick-fil-A One on our mobile app, and this is just a small way to show our appreciation for dining with us," Kaitlyn White, senior lead of the Chick-fil-A One Membership program, said in a statement. "Our membership program is just as much about what you give as what you get." The bottom line: sign up and get your free nuggets, people. Of course, you'll also have to decide between the crispy nuggets and the grilled nuggets first. Oh, and good choosing which dipping sauces you want to get with your free nugs. You have until the end of the month to figure this out, so don't mess it up.